KATHMANDU, May 17: The ruling Nepali Congress and main opposition CPN (UML) are seen in neck and neck competition in the first round of the local elections. As vote counting entered the third day Congress and UML seemed in a tight race to emerge first in terms of winning the chiefs and other positions of local units in the first round local elections held on Sunday. EC is electing the chiefs and other positions of the local units together with ward representatives in 283 local units. The chiefs of two local units were elected unopposed before the poll date. By the time this story was filed, main opposition UML emerged winner in 52 local units while the NC won the chiefs and other positions in 51 local units. The ruling CPN (Maoist Center), which has forged an electoral alliance with Congress including in Bharatpur, Kathmandu and Pokhara, was left far behind in early vote counting. The Maoist party stood third in the race for chiefs and other positions in 22 local units. Similarly, Rastriya Prajatantra Party has emerged winner in one local unit. 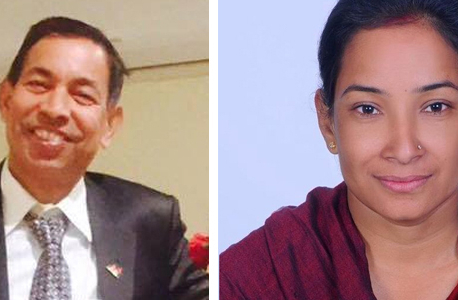 According to our district correspondents, Congress and UML were seen in a tight competition in securing the chiefs and other positions of the local units. Of the total local units, independent candidates emerged winners in three local units while the vote count has not yet begun in eight units after the voting was rescheduled, according to the EC. 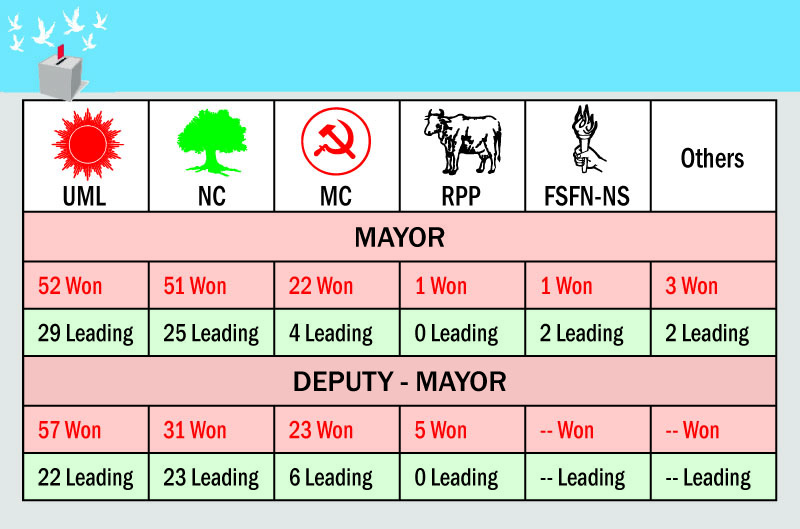 Details compiled by correspondents show Congress leading in 25 local units while UML was ahead in 29 local units. The EC, however, informed that vote counting was completed only in 74 local units. Of these, UML won most seats followed by Congress. UML won 31 seats while Congress won 23 and the Maoists stood third in the race. The vote counting was tedious and the number of invalid votes was higher compared to previous elections. Following criticism of the EC over slow vote count, election officers have begun counting votes from at least 10 different counting centers in Kathmandu, Pokhara and Bharatpur. “We have asked them to count the votes by setting up 10 different counting spots in Kathmandu, Bharatpur and Pokhara,” said EC spokesperson Surya Prasad Sharma. The EC believes vote counting in the rural municipalities will be complete by Friday and it may take at least a week to complete vote counting for municipalities. Immediately after the EC’s instructions, returning officers in Kathmandu Metropolitan City have begun counting votes in 11 counting centers.